Powers/Abilities: The "powers of the atom" - superhuman strength, flight, superhuman speed, invulnerability, "atomic vision" and able to melt metal with his hands. History: Barry Dale was a nuclear scientist working at the Atomic Institute, who gained superhuman powers: "Evidently my body is so geared as a result of working on radium and uranium that it can explode atoms and give me atomic strength." Comments: Created by Jerry Robinson. Atoman's title laster for two issues. 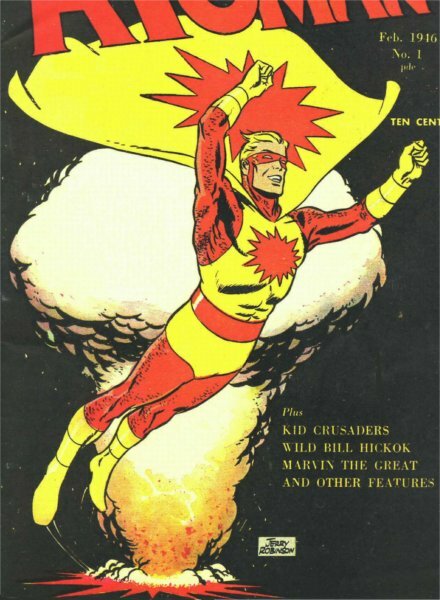 Atomic Tommy, a British hero of the 1940's, given superstrength by an "atomic jacket"